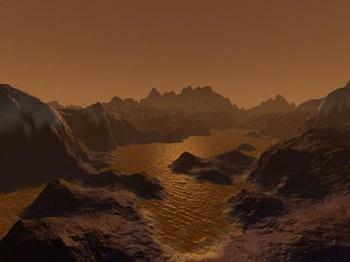 Saturn’s Titan -A Giant Organics Factory. Saturn’s orange moon Titan has hundreds of times more liquid hydrocarbons than all the known oil and natural gas reserves on Earth, according to new data from NASA’s Cassini spacecraft. The hydrocarbons rain from the sky, collecting in vast deposits that form lakes and dunes. At an eye popping minus 179 degrees Celsius (minus 290 degrees Fahrenheit), Titan has a surface of liquid hydrocarbons in the form of methane and ethane with tholins believed to make up its dunes. The term “tholins,” coined by Carl Sagan in 1979, describe the complex organic molecules at the heart of prebiotic chemistry. Cassini has mapped about 20 percent of Titan’s surface with radar. Several hundred lakes and seas have been observed, with each of several dozen estimated to contain more hydrocarbon liquid than Earth’s oil and gas reserves. Dark dunes that run along the equator contain a volume of organics several hundred times larger than Earth’s coal reserves. Proven reserves of natural gas on Earth total 130 billion tons, enough to provide 300 times the amount of energy the entire United States uses annually for residential heating, cooling and lighting. Dozens of Titan’s lakes individually have the equivalent of at least this much energy in the form of methane and ethane.